On this episode, Fr. Evan takes listener calls asking questions about spouses in heaven, purgatory, confession, and the real presence of Christ in the eucharist. This was a pre-recorded program where John Maddex joined Fr. Evan to answer email and voice mail questions. The questions dealt with Theosis, Purgatory, did God create evil, and grace. Together with Fr. Lou, Fr. 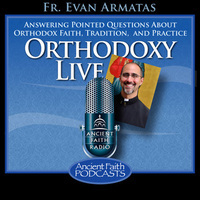 Evan takes questions related to friendly parishes, purgatory, and how to best relate to a spouse who is not interested in Orthodoxy. In this episode which aired live on Feb. 16, Fr. Evan takes calls from listeners dealing with the real presence of Christ in the eucharist, the humanity of Christ, and more.